For many youngsters in and around the Rochester area, the summer not only brought the welcome end of “pencils, books and teacher’s dirty looks,” but it also ushered in the season of Seabreeze. I can’t say Seabreeze offered the same “cash in your A’s for free tickets” promotion that Fantasy Island did. I can’t say because I didn’t get any A’s at the end of fifth grade. In fact, nobody got A’s at Florence Brasser Elementary School back then – or B’s or C’s or D’s, for that matter. No, we got “E” as in excellent, “S” as in satisfactory, “U” as in unsatisfactory and, in the few cases where students spent the bulk of the term in sickbay, an “I” for incomplete. My friends back in Blasdell expressed shocked disbelief when I revealed my report card contained a disproportionate share of E’s – at least until I told them the scoring system. So, sans the “A gets you free tickets” incentive, we didn’t get a chance to visit Seabreeze that summer. I just got to hear stories about it. Lots of stories. They told stories of the famous carousal, which probably excited my sister more than me. They told stories of its legendary roller coaster, which, admittedly, did pique my interest. What they didn’t tell, however, were stories of the rich and fascinating history of Seabreeze. Located on the west side of Irondequoit Bay on the shores of Lake Ontario, Seabreeze has long attracted attention, and not just because of its purifying waters. After a thwarted war with the area natives in 1687, the French decided to play nice with the Seneca and, in 1718, built a trading post (Fort Des Sables, which is French for “Fort of the Sands”).1 While this might have pleased the Seneca, the British didn’t take too kindly to the idea. They built a competing fort (Fort Schuyler) in 1721 down the Bay and by 1759, had run the French out of Greater Western New York all the way through Fort Niagara,2 signaling the beginning of the end of the French and Indian War. Though this fact may have been concealed from many, the real hidden gem in this story lies a few blocks away in a densely urbanized section of Irondequoit. It’s a wonderful slice of sentimentality, perfect for the young and old alike. I didn’t discover it. My daughter Catarina did while interning for a photographer the summer before her senior year in high school. She didn’t realize just what a gem she had discovered. It was the oldest miniature golf course in the United States. But we move too fast. Go back to 1930 and the height of the miniature golf gold rush. In that year, in the middle of a typical working class community, the Tall Maples Miniature Golf Course was built. Now called Whispering Pines, it, together with the adjacent Parkside Diner, is currently owned by two brothers, Jim and Greg Papas. Parkside Diner and Miniature Golf is nestled off the shores of Lake Ontario in the Seabreeze neighborhood of Irondequoit, Monroe County. One Saturday my son Peter’s high school football team played in Irondequoit. After the game I visited Whispering Pines. It really is a comfortable setting. Surrounded by trees, it’s a small, shaded park amidst a modest urban neighborhood. The course itself is a throwback of sorts. Without the ostentatious glamor of modern courses, it’s perfect for younger kids as the holes lack the complicated geometry of the newer layouts. Though a full 18 holes, it also has the advantage of a small footprint, meaning mom and dad can sit on a nearby bench and sip an ice cold pop without the fear they’d lose sight of their kids, who can play safely within the park’s fenced-in perimeter. I snapped a few pictures and then went in to the diner to find one of the owners. It was a busy place for a Saturday, but the waitresses were most accommodating. Jim Papas was in the back cooking for the crowd and, despite my insistence he not be disturbed, his staff went and got him. Jim told me he and his brother had owned and operated the Parkside Diner since 1990. They purchased the golf course in 1996 and, as far as they know, there have been only two prior owners of the property. “We thought the miniature golf course would be a great investment and easy to operate since we were already on the premises. At the time of purchase, we really knew nothing of the history of the course,” says Papas. Being the oldest existing golf course in America, Whispering Pines has received its fair share of national accolades. 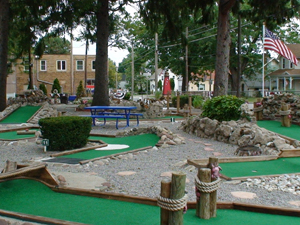 In 2002, it was listed on the National Register of Historic Places.17 It’s been named by the NileGuide as one of “America’s Classic Miniature Golf Venues”18 and has even been featured on ESPN.19 “The course is a landmark the whole town can be proud of,” says Papas. One more thing about Whispering Pines: they dug up cobblestones from the historic Erie Canal and brought them in to build the original course in 1930. By strange coincidence, the location of our next hidden gem got its very name from that same canal.